At the end of March the new M/Y 135 of the yachtbuilder CNR, part of Ferretti Group, hit the water for the first time during a private ceremony in Ancona. 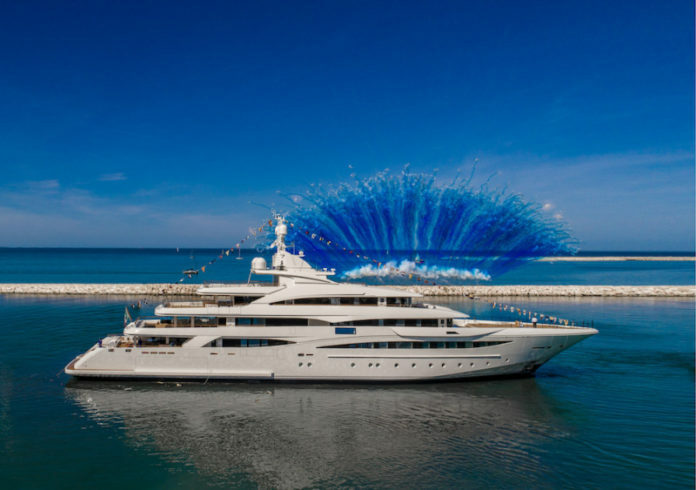 Over a thousand people were on hand to witness the occasion at an elegant event, that represented a proud moment for the team of professionals who worked on her design and build. The new 79m yacht, with a 13.5m beam, is characterized by a smooth profile and svelte lines. This design is the result of a collaboration with the naval architects of Zuccon International Project, who took care of the external lines, and the Rome-based studio Laura Sessa, the creative mind behind the interior design. 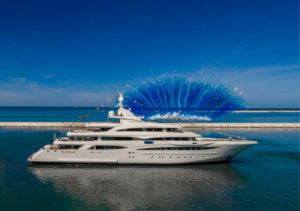 The vessel has five decks accommodating 12 guests in five VIP cabins and a large owner’s suite, along with room to house a whopping crew of 39. Upon completion, M/Y 135 will be the second longest vessel ever built at CRN after its 80m flagship Chopi Chopi, delivered in 2013. “Giò Ponti used to say that the interior décor of a ship spoke volumes about the standards of the civilization that offered its hospitality on that shi. Turning to the new 79-metre yacht by CRN, I would say that both the exterior and the interiors – and in general the impeccable design of the whole ship – are a glowing testament to the supreme skill and construction excellence that are the hallmark of our historic yard in Ancona” said Alberto Galassi, Chairman and CEO of CRN and CEO of Ferretti Group. The Italian yacht will achieve a top speed of 16 knots, thanks to twin Caterpillar diesel engines, and will be cruising the Mediterranean this summer. This creation is a product of nearly 200 professionals, and CRN credited the entire team of professionals, including project managers, project architects, engineers, technical designers and specialist craftspeople for their valuable work. “Motor yacht 135 is a wandering work of nautical art that will be a worldwide flagship for the dazzling mastery that only Italy at its best can create” stated Alberto Galassi.